Angry youths burnt a Celestial Church Of Christ building, a vehicle and a police outpost, following the death of a boy alleged to have been 'sacrificed' by the pastor of a church. Angry youths have burnt a Celestial Church Of Christ building, a vehicle and a police outpost at Bayan Dutse in Chikun local government area of Kaduna state. The incident which happened on Wednesday, followed the death of a boy alleged to have been 'sacrificed' by the pastor of a church. It was gathered that the boy who is in his early twenties attends Evangelical Church Winning All (ECWA) Gospel church Narayi in the same Chikun local government area. According to neighbors, the deceased was serving as a mason boy to the pastor of the church who was building a demarcation inside a river beside the church, when all of a sudden he fell into the river and died. The pastor was said to have immediately ran to the nearby police outpost to report the incident. Meanwhile, angry youths who heard of the incident alleged that the white garment church pastor may have used the boy as a sacrifice. 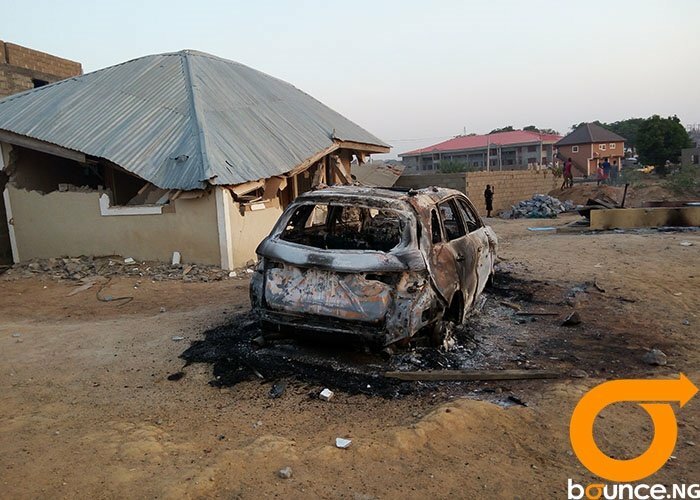 The youths swung into 'action' and burnt down the church and a jeep belonging to a member of the church parked inside. The youths also took to the street protesting the killing and demanding to see the pastor, who was said to have been taken to Barnawa police station. Meanwhile, the remains of the deceased was buried at 10pm Tuesday night beside the river, after prayers were offered for his remains by the pastor of his church, Pastor Mark Ayuba. He however urged the youths to accept what happened as the will of God and pleaded against taking the laws into their hands. As at the time of filing this report, the name of the pastor could not be ascertained, while that of the deceased was simply gotten as Sylvester. When Bounce News contacted the Police Public Relation Officer (PPRO), ASP Mukhtar Aliyu he confirmed the incident and arrest of some boys he described as 'miscreants' adding that the Pastor is in the custody of the police. According to him, "We acted proactively to rescue the pastor but the youths took the law into their hands and set ablaze the church and our outpost." The Commissioner also directed a meeting with community leaders of the area and the Divisional Police Officer (DPO) of the area, and promised "to arrest and prosecute accordingly whoever has a hand in the death and burning of the outpost and the miscreants who used the opportunity to wreck havoc after our investigation"